This is that time of the financial year, when every company (PVT or LTD) needs to comply with annual filing with Registrar of Companies (ROC). In our experience not many entrepreneurs are attentive to this requirement, and even if they are, they tend to ignore it, resulting in stringent penalty. The Companies Act, 1956, the guiding law for companies mandates for every company to file their Balance Sheet and Profit and Loss Account along with the audit report within 30 days from Annual General meeting. The company is also required to file annual return containing information such as the name of the company, its registered office, its principal business activities, capital in the company, details of all the directors and shareholders etc. as on the date of Annual General Meeting within 60 days from the date of Annual General Meeting. In the following write-up, we have summarized each of these e-forms, its content and pointers. Where balance sheet is laid before but not adopted at the AGM or the AGM was adjourned without adopting the balance sheet, a statement of the fact and reasons thereof has to be filed along with the balance sheet, etc. within 30 days of the AGM. In case of a company whose shares are listed on a recognized stock exchange; the return is to be also signed digitally by a secretary in whole-time practice. 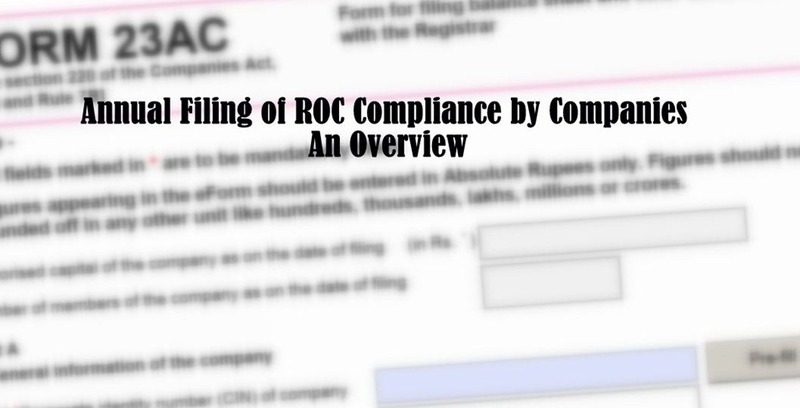 In case the Annual General Meeting of the company is not held for the same year, the aforesaid Compliance Certificate to be digitally filed with the ROC within 30 days from the latest day on or before which that meeting should have been held. Further the due date also been extended for filing of e-form 23B without any additional fee till 23.12.2012 or due date of filing whichever is later. how can i revise any mistake in auditor report filled by us currently . I am finding penal charges for late filing of annual returns 23ac, 23aca and 23b. Can u tell me what are the original fee payable to ROC for filing the 3 returns. I have registered my company in the month of mar14 and opened the current account in the month of may 14, in between I didn’t do any business. Do I need file return with ROC for fy13-14. Pls reply. its 5 crore not 50 crore for compliance certificate, Company having paid up capital of Rs 10 lakh or more but less than 5 crore need to file compliance certificate, don’t mislead the people. Thanks for the useful information. 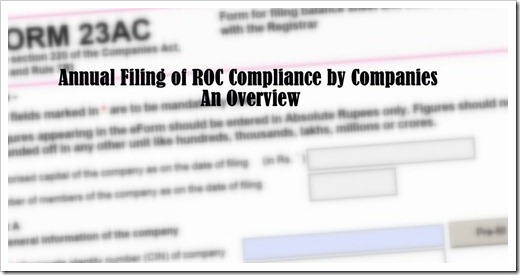 This article is really great for start ups looking to get information about annual filing of ROC compliance. incorporation of a private limited company in delhi. There are few step to incorporation a private limited company. 4. Name has been approve, Then draft Moa & Aoa and then filled Form 1, 18, 32, for Incorporating a company. 5. After approve form 1, 18, 32. Then you have receive a Certificate of Incorporation. Than start your Business. Formation and Incorporation of a public limited company in India. There are two stages in the formation of a public limited company, promotion and its incorporation. The process is prescribed under the Indian Companies Act, 1956. A public company has to undergo capital subscription stage and then get certificate of commencement of business, to begin operations. The stages of promotion of the company are by and large related to strict documentation which are prescribed.